Located in the sunny Playa de las Américas, the sea-facing H10 Conquistador is a four-star hotel offering luxurious accommodation with modern facilities. As the hotel is very close to the promenade, it offers amazing views of the sea. The beach is barely a four minutes’ walk away from the property. 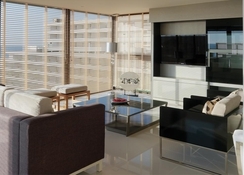 The bright and modern decor in maritime theme is complemented by deluxe furnishing. For an exclusive touch, H10 Conquistador provides Privilege rooms and services, where you can enjoy the privilege lounge with free bar service, exclusive terrace with Jacuzzi, Balinese beds and sun loungers, privilege solarium in the swimming pool area, free access to the Despacio Thalasso Centre and much more. 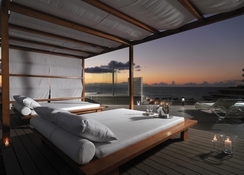 The Hotel Conquistador Tenerife offers both half-board and all-inclusive options. There are multiple restaurants, coffee shops and bars to cater to your taste buds. Soak all day in its lagoon-style pool or lie on a sun-lounger sipping cocktails from the pool bar, H10 Conquistador serves you with its warm hospitality. The spa at the health and beauty centre pampers guests with various relaxation therapies. With direct access to the promenade, H10 Conquistador Tenerife offers fabulous sea views and is barely 600 metres away from the Playa de las Américas beach. The town centre of Playa de las Américas is a 5-minute walk, while Los Cristianos isn’t too far away. Golf las Americas, a fabulous golf course is 1.5 km away, while Siam Park (Water Park) is 2.5 km from the hotel. The nearest airport is Tenerife South Airport, which is around 17.5 km. The Tenerife North Airport is 81.5 km from the hotel. 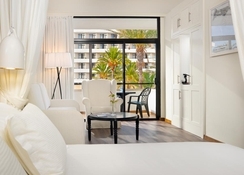 The 485 air-conditioned rooms at H10 Conquistador in Tenerife are bright and well-lit. The rooms come in categories of Double Room, Double Room Sea View, Superior Double Room, Privilege Room and Junior Suite, all of which are well-furnished with a minibar, a satellite TV, free Wi-Fi and other amenities. Guests opting for Privilege Rooms get to enjoy the pool and/or sea views, a Nespresso machine, iDock station, welcome gift, pillow menu and much more. The Hotel H10 Conquistador is truly a gourmet’s delight with its array of restaurants that cater to every palate. Its main restaurant Tajinaste offers buffet style meals. For a la carte meals, guest can choose from the Italian restaurant – La Vita è Bella, or the Oriental Teppanyaki Sakura. There is also an American Steak House beside the pool, while Mike’s Coffee serves hot beverages, bakes and sweets. The Dinner Show Senses Restaurant offers a 5-course menu along with a special live show. There are plenty of bars too, including regular pool bar, teide disco bar, the poolside bar-restaurant Mencey or the regular Drago bar located in the lobby, which organizes live music at night. The H10 Conquistador Hotel has 2 adult swimming pools, a children’s pool, a chill-out area with sea views, Pilates centre, sports club and tennis courts. The Despacio Thalasso Centre offers spa, Turkish baths, a sauna, a dynamic pool with aqua massage beds that provide hydrotherapy treatments, massages and facials. For the children, there’s a playhouse, a playground, a mini disco, water games and other activities. The Daisy Club arranges fun games for children aged 4–12 years, while the Teen Club has Play Station and film projector for those between 13-17 years. Amazing hotel - would definitely go back, something for everyone!! !